Will the California Drought end in 2017? 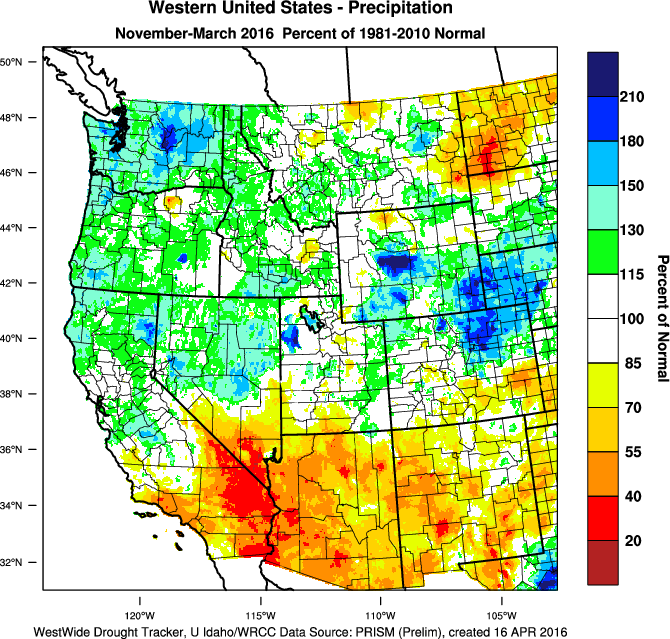 The 2015-2016 rainfall season brought some relief to California, following several years of well-below-average rain and snowfall. The northern half of the state received more-or-less average rain and snowfall, but the much-vaunted El Niño Southern Oscillation did not live up to expectations for the southern half of the state. The El Niño conditions ended in May, and a band of cool ocean water is now developing in the central and east-central Pacific. This phenomenon is associated with the La Niña flipside of the Southern Oscillation. Empirically, La Niña tends to be associated with dry winters for California, but the connection is by no means one to one. It therefore falls on Metaculus to determine whether the drought will be busted in 2016-2017. The severity of regional drought conditions is tracked and updated weekly by the National Drought Monitor. As of June 11, 2016, 42.8% of California's area is classified as experiencing "extreme" (code D3) or "exceptional" (code D4) drought. The last date at which California was free of such conditions was August 6th, 2013. On May 01, 2017, will the National Drought Monitor show that California is entirely free of areas experiencing extreme (D3) or exceptional (D4) drought?